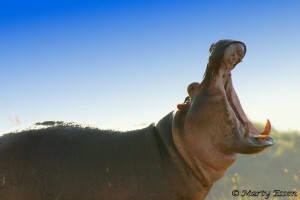 Adventures and world travel can come at a cost, and Marty felt the sting of one of the world’s most venomous insects, was attacked by a Hippo, had been surrounded by wolves, got bitten by a poisonous snake, and came out of it all smiling. 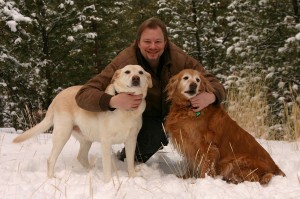 While camping in the below freezing temperatures of Canada, his dogs kept him warm. Marty Essen is currently on tour with his Around the World in 90 Minutes lecture, featuring many of the thousands of photographs he took during his travels. He took time out for this interview to share with us his experience and many wonderful photographs. I hope you enjoy it as much as I did! 1. How did you arrive at the idea for this book? Had you and your wife Deb been world travelers before this Seven Continent project? My wife, Deb, and I hadn’t done much traveling. In fact we hadn’t taken a vacation in many years. 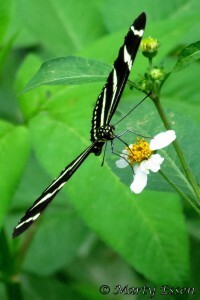 Then we went to Belize and fell in love with wildlife-oriented adventure travel. 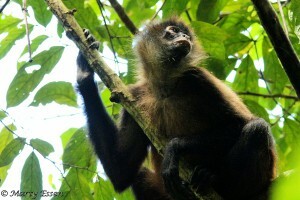 Our next trip was to the Amazon Rainforest in Peru. Before we left, the Ravalli Republic newspaper (in Hamilton, Montana) asked me if I would write a story about our Amazon adventures. That feature story ran not only in the Ravalli Republic but also in the much larger Missoulian newspaper. After that story was published, people recognized me from the author photo, and whenever I was out in public, they’d approach me and tell me how much they loved the story and asked if I was going to write another one. That led to us traveling to Australia. After the second story was equally successful, I realized that I had something there. So I did some research and found out that no one had ever written a book before on the subject of traveling to all seven continents, looking for rare and interesting wildlife. With that in mind, we continued our travels, in what became a magical and unforgettable journey! 2. When you put all these trips together, keeping in mind your respect for the environment and leaving a light footprint in the wake of your travels, did you sit down and make a grand plan or take it one Continent at a time? Did you get any expert advice or help from knowledgeable friends? Respecting the environment was always foremost on our minds. Also, as I wrote my book, I worried about telling the public about all the great places we found, for fear that sending others there would contribute to their degradation. Ultimately, I decided that sharing such places would make people want to protect them more. 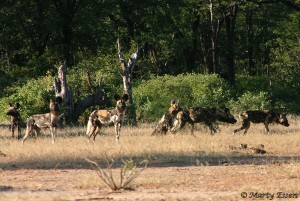 After all, many people find it hard to get excited about protecting an obscure place they know nothing about. Once we had the plan to travel all seven continents, my wife and I did all the research ourselves. The Internet is great for things like that. We searched out and then—when necessary—interviewed people we would be working with. It would have been very difficult to plan and do what we did before the invention of the Internet. 3. Can you give us an overview of where you went? How did you choose which places to visit – or did the non-furry “cool creatures” do that for you? 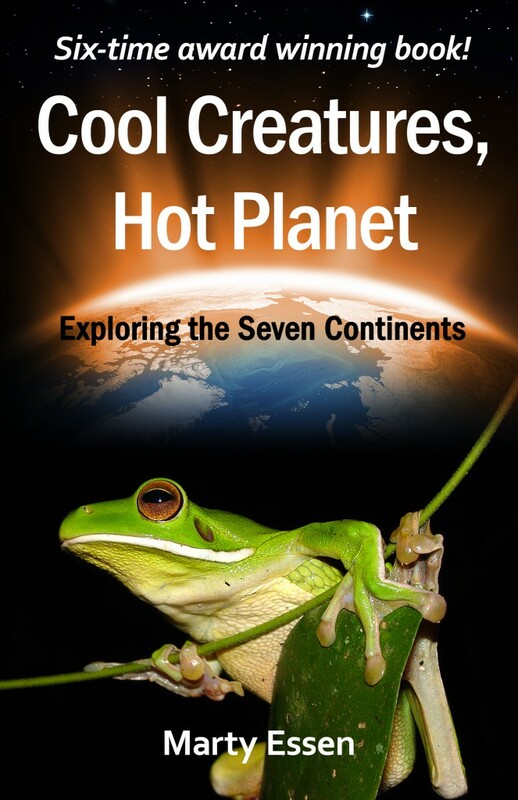 My first book, Cool Creatures, Hot Planet: Exploring the Seven Continents, starts out in Central America (Belize). Then we go to the Amazon Rainforest (Peru); Queensland, Australia; travel to the top of Canada; sail via Russian research vessel to Antarctica; backpack with a reformed headhunting tribe in Borneo; romp through Spain, France, Switzerland, and Andorra; and finally complete our travels with an unforgettable adventure (which included surviving a hippo attack) in Zimbabwe, Africa. As for choosing where to go, our extensive pre-trip research did that for us. Usually Deb or I would find some sort of nugget that told us “go there.” Amazingly, we never had a problem agreeing on our destinations. 4. Did any of your intended subjects elude your camera – any “one that got away” moments? At the beginning of Cool Creatures, Hot Planet, I was still in the process of moving my camera gear from film to digital. In Australia, my primary camera was film-based. Finding platypuses was a major goal that we were excited to accomplish. However, as I learned later, I took roll after roll of blurry platypus photos! The reason was because the platypuses lived in a cloudy river, so I had little or no notice when they’d surface. If I had the high-speed digital camera gear that I have now, that would have never happened. But, at least, it gives me an excuse to return to Australia! 5. This is not the usual travel book – while it’s rich with wonderful photographs you expect from a travel book, and delight in, it’s a more intimate account of your experiences as you traveled. 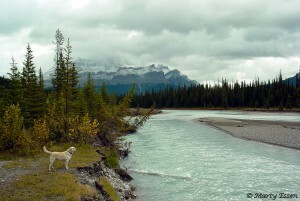 I got that sense particularly in the chapter on your travels with Deb and your dogs Annie and Kate through Canada. 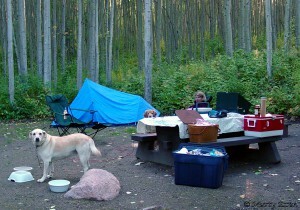 You all seemed to know what you were dealing with in your camping escapades – even the dogs! Are you all seasoned campers? Sure. Although Deb and I now live in Montana, we both grew up in Minnesota. And in Minnesota, camping is part of the culture. But even though our Canada trip was the most like where we grew up, we certainly had some unexpected adventures. 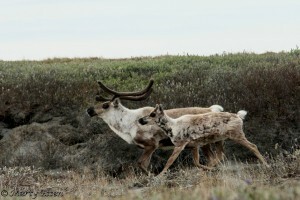 I absolutely loved northern Canada and hope to return there again soon. The dogs love Canada too. In many ways it was the ultimate dog trip, as they got to do all of their favorite things: ride in the truck; swim in a lake or a river every time we stopped; and, of course, regularly have some new and disgusting smell to roll in. 6. Oh, and I have to know – since I think it was below freezing at one point while camping, and you were wet with condensation from the dogs when you awoke, just how cold does it have to be before you get a room??? In northern Canada, the nearest hotel could be hundreds of miles away. We were going to sleep in a tent—pretty much no matter what the temperature was. And it really was comfy in a small tent, with the dogs snuggled up next to us. 7. You traveled over 5500 miles on the Canada trip – that’s like going from the East Coast to the West Coast and back again, depending on where you start. Close quarters, especially with two dogs. How did you avoid fractious behavior (from the dogs not the people)? I don’t remember any serious disagreements, as we were going through such interesting and beautiful country. 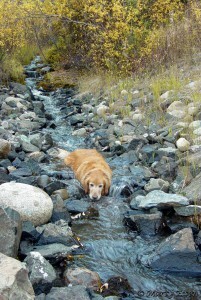 I guess the worst was when Annie (our white Labrador retriever) took off down a shallow river, where we knew grizzly bears were fishing, and refused to immediately come back. 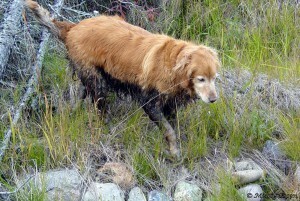 I was terrified that Annie would have an unfortunate run-in with a grizzly, but everything turned out okay. If we do a similar trip in the future, I will be better prepared. I don’t like shock collars, but I found something that works just as well: beeper collars. These collars were designed for bird dogs, and you can set them so you can make them beep by remote control. Now, if a dog decides not to listen to me, I “beep them.” Not only can I instantly locate the dogs by the sound, the dogs don’t like the beep and immediately come running back to me. 8. 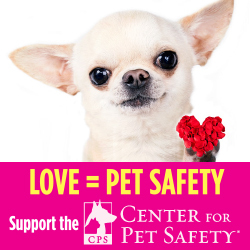 Tell us about your favorite experience with the dogs and would it be their favorite too do you think? 9. What advice would you offer to those who are planning their first week-long camping/wildlife adventure with their dogs this year? It really depends on the dogs. But first and foremost, make sure you have a plan to accommodate the dogs at all times. Never, ever, should you leave your dogs in a hot car while you go off and do something in a place where dogs aren’t allowed. Also, if your dogs are easily tempted by new things, I suggest getting a remote control beeper collar, like the one I mentioned earlier. Just make sure that if you do get such a collar that you and your dog practice with it at home first. 10. This was quite an investment of time and money – how long did take to complete? I would think editing down to 80 photographs out of what must have been hundreds of pages of proofs was a months long process in itself. We completed our travels to all seven continents in three-and-a-half years. Each trip was about three weeks long, and in between trips I did a lot of writing and research. Our trips to Zimbabwe and Antarctica were quite expensive, but the others were more reasonably priced. What helped, for us, is that we saved up our money well ahead of time (by not taking vacations) and I had earned quite a few airline miles through my credit card. My first book took me approximately 13,000 hours to write, research, and narrow down to 80 color photos. 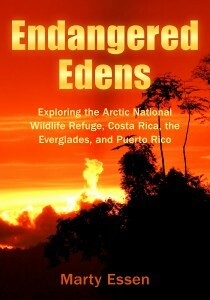 My second book, Endangered Edens: Exploring the Arctic National Wildlife Refuge, Costa Rica, the Everglades, and Puerto Rico, went much faster. And with my second book, I had room for 180 photos, so I didn’t have to agonize quite as much about which photos would make the book. 11. Wisely letting no great journey lie fallow, you created a slide show for this first book, now in its second printing, called Around The World in 90 Minutes, that you’ve expanded to include experiences from your new book Endangered Edens. Who gets to see this – are they personal presentations you make? In late 2007, I turned my first book into a one-man show that I call “Around the World in 90 Minutes.” It is one-part slide show, one-part lecture, one-part theater, and one part stand-up comedy. I perform the show primarily at colleges—although I sometimes do it at theaters, zoos, and museums as well. I have a blast performing the show, and it has become one of the most popular slide shows of all time. In fact, as am answering your questions, I’m in the midst of a month-long speaking tour that takes me to colleges in Illinois, Wisconsin, New York, New Jersey, Pennsylvania, and Nebraska. For my new book, Endangered Edens, I have a shorter, less-elaborate show that I do at bookstores. 12. Endangered Edens: Exploring the Arctic National Wildlife Refuge, Costa Rica, the Everglades, and Puerto Rico – what was your mission for this book and can you give listeners a sense of what you found and what you hope readers will get from it? Endangered Edens: Exploring the Arctic National Wildlife Refuge, Costa Rica, the Everglades, and Puerto Rico continues Deb’s and my travels to the locations mentioned in the title. The main difference is that it is a more photo-intensive book, printed on high-quality glossy paper. It’s truly a beautiful book, while still containing exciting adventures and stories that will make you laugh. I also write about how the wonderful places we visited are endangered by human activities—primarily oil drilling, global warming, and the black market for animal products. 13. What would you consider to be one of the most important lessons learned through your travels? In Cool Creatures, Hot Planet, we did much of our travels during the Iraq War, and even visited a Muslim country (Malaysian Borneo) the day after U.S. soldiers tore down Saddam Hussein’s statue. We met people from more than twenty countries, and found that we were much more alike than different. So I guess my lesson was that we, as Americans, spend way too much time fearing people from other countries. You can find great people, with common goals, all over the world! 14. And to wrap up, where can people find you on the web? Many thanks to Marty Essen for the use of these fantastic photographs and for making time in his busy schedule to talk with Dancing Dog Blog on Earth Day about Cool Creatures, Hot Planet: Exploring the Seven Continents! @dancingdogblog what a beautiful family photo! @pawesomecats That was one of my favs, too! What a great interview to land! He must have been extremely interesting to talk to! You always do such a knock out job with interviews. Now this is a book I'd love to read. What fantastic books to share for 'Earth Day.' I love that the dogs love Canada. I will have to look into getting the books. The photos are beautiful and I love reading about people's adventures. Wonderful book and pictures. Wow! Thanks for sharing! What a wonderful journey! Thank you for sharing such beautiful photos. As a dog trainer, I think the beep collar is definitely something I need to expand on. I am totally against shock collars. Thank you again for sharing such a wonderful adventure. 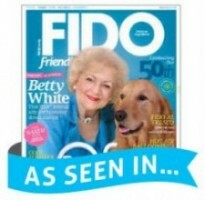 @thedogtraininglady Ha! I was equally interested in the beep collar. What a wonderful alternative to this reliance on shock collars. Glad you enjoyed the stories Marty shared, and all these great photos -- I smile every time I scroll through them and I didn't even take a trip like this -- though I do recall Peru and the monkeys and butterflies =) The world can be a fabulous place! This sounds like a wonderful book and the pictures are gorgeous. Thank you for sharing! What a wonderful and interesting interview! 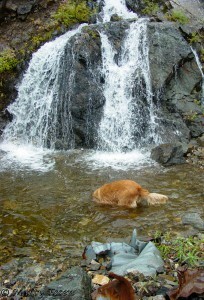 I love how they experienced it together with their dogs - not sure I could do a tent in freezing temps, but I so enjoyed their experiences as an armchair traveler! And loved the pics! Sounds like he has had some fascinating adventures! I love the photos! This must be a really exciting career. It would be amazing to see all of these places and animals. Kudos to them for being so dedicated to getting their projects completed. 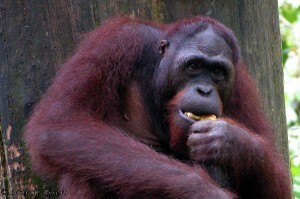 I bet they have made a huge impact on how people see these places and animals. @ThePlayfulKitty A great example of carving out the life you want, Robin -- I think it makes everyone else come alive when around people that do this =) I still would love to see that slide presentation, and yes, I agree he makes an important contribution to giving people a new perspective on life. What a beautiful book and Marty is clearly a rockstar - "We completed our travels to all seven continents in three-and-a-half years" this is incredible and his journey is definitely something I'd be interested in reading. So glad you posted a Q&A! Great interview - loved Marty and Debbie's story. @sarcasticdawg I'm so glad you enjoyed it -- what a way to spend three and a half years, eh? Incredible info/story, thanks for this interview. Great interview and love the sound of books and show. Wonderful to turn passion into such a great project. Previous post: Pet Insurance: What’s Best For Your Pet?